Our Solutions for Customer Needs. Customers buying our products and services show a variety of individual needs; we work hard to provide the best solutions. 1. 6 Month, 50% buy back scheme This scheme helps customers staying in New Zealand for longer than 1 month. Rather than renting the bike, they buy the bike and return it to us at the end of their stay. This way they save money from renting and have 6 whole months to tour around with the bike. 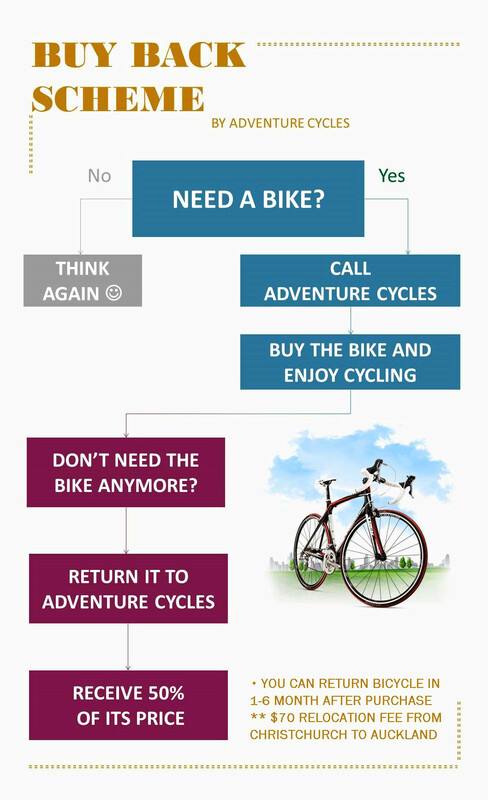 When returning the bike we pay them 50% of what they originally paid at the beginning; the customer can also choose to keep the bicycle or sell it to someone else for the market rate. Our customers say this represents an incredible bargain. 2. Free Service Checks This applies to anyone buying our bikes. The customer gets 3 free service checks, so they maximise their enjoyment and safety by keeping the bike in optimum condition. 3. Free Accessories with Rentals This scheme applies to our rental customers; they don't have to bring their own helmets and tools as we provide them without any charge for the time of their rental. We encourage longer-term renters with a favourite saddle, helmet, clip-in shoes and pedals to bring these with them to use with our rental bike. We not only offer individual bikes or accessories at reduced prices but we also create individual special deals with our customers with a package best suited to their needs. We do not advertise half price bicycle deals as some other shops do. However, our normal prices, particularly on used bicycles, offer more utility for you than any offer from another bicycle shop. We insist on selling the right size bicycle, appropriate to your needs, with free riding position setup and adaptation tailored to your personal preferences. 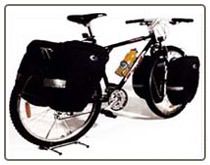 We will point out the most efficient and most comfortable positions and help you find the position which encourages you to maximise your bicycle riding and pleasure. Everything we sell comes with a 1 year warranty and 3 free service checks to optimise your cycling pleasure. Our guaranteed buyback does make it half price, up to 6 months. You won't find this offer from other shops. It applies to everything we sell other than personal clothing.